General elections, the political spectacle that arg­uably overshadows every other event in India, may still be a year away, but the country seems to have caught the poll fever already. A spate of elections—from Karnataka to Kairana—has nudged public discourse towards what could be in store for us in the parliamentary polls scheduled for mid-2019. Elections being the flavour of the season, political pundits are on overdrive and holding forth on what to expect. Modi hawa, the wave that swept the BJP stalwart to power in 2014, we are told, has considerably ebbed. In its place, many talking heads say, are festering pockets of disquiet that are apparently dragging down the prime minister’s popularity. Petrol prices heading north, rising farmers’ distress, a gnawing sense of insecurity among minorities and increasing restiveness among Dalits and other marginal sections of the society are reportedly working against Modi and his NDA government. READ ALSO: Who From The Opposition Will Take On The Prime Minister? The biggest talking point in recent weeks, however, has been the signs of emerging unity among what is otherwise known to be a fractious and disparate opposition. The Congress and the Janata Dal (Secular) came together post-election to thwart the BJP in its bid to capture power in Karnataka. In Kairana, Uttar Pradesh, the Samajwadi Party, the Bahujan Samaj Party, the Congress and the Rashtriya Lok Dal buried their differences to sink the BJP’s chances of retaining the parliamentary seat. It followed similar reverses for the ruling party in the bellwether state against a united opposition in Gorakhpur and Phulpur. 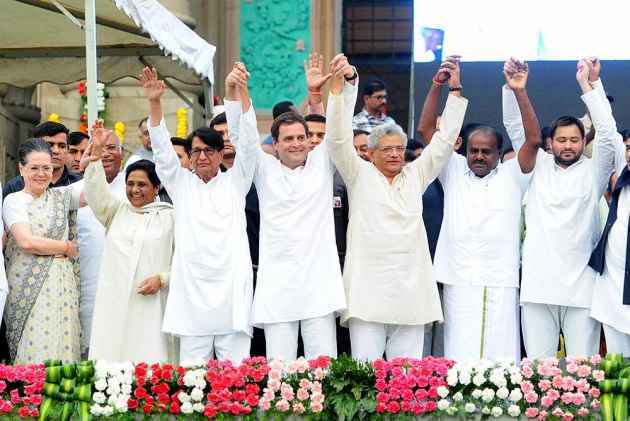 The recent results signify that once the opposition parties come together, burying their conflicting ambitions and ideological differences, they will have an arithmetical advantage. It could have been so even in 2014. In Uttar Pradesh, where the BJP won 71 of 80 Lok Sabha seats, statistics show that no less than 51 of those 71 would have been won by an alliance of the SP, the BSP and the Congress, had it existed then. Bridging differences within opposition ranks is, of course, no easy task. The Congress has its own compulsions and may find it hard to accommodate the prime ministerial ambitions of regional leaders by sacrificing Rahul Gandhi’s. Many such leaders—Mayawati of the BSP and Mamata Banerjee of the Trinamool Congress, for instance—are mercurial and difficult to deal with. At the other extreme is Odisha CM Naveen Patnaik of the Biju Janata Dal, reticent and difficult to gauge. Yet, the very prospect of a combined opposition taking on Modi has already livened up the imp­ending contest. The opposition’s arithmetic, pitted against the chemistry that Modi enj­oys with the people, promises a closely fought race. Adding to the thrill is our fascination for the unknown. We do not know yet who among the opposition leaders will be Modi’s principal challenger and the prospective PM candidate. Possibly, even the opp­osition has no clue and the lack of clarity infuses greater excitement. For all practical purposes, the prospects are pre­gnant with possibilities. Modi is unmatched when it comes to stature, charisma and oratory. But will he manage to pull it off again, against what many pundits predict? And will a challenger emerge from the surfeit of opposition leaders, between now and the elections, to put a face to the opposition fight and take the battle to the BJP camp? The imponderables are many and they are adding to the unpredictability of the elections. Much has been written about Modi, his supposed invincibility as well as his shortcomings. In our latest Outlook cover, we turn our gaze on who among the opposition could be Modi’s principal opponent. It’s something the nation wants to know. After all, the fight to become the challenger promises to be as intriguing and bruising as the 2019 election.